To be fair to Buhari, his obsessive defence of Abacha predates his presidency. At the tenth anniversary of the death of Abacha that was held in his home State of Kano in 2008, Buhari and his successor, General Ibrahim Babangida, claimed that Abacha never stole Nigerian money but that the goggled General was indeed the cement which wedged Nigeria together. If the statistical estimation of Nigeria’s population of 60 percent youth is anything to go by, then a very few percentage of Nigerian youth, in their multiples of millions, witnessed the reign of terror of General Sani Abacha, Nigeria’s head of state between 1994 and 1998. Thus, when President Muhammadu Buhari, last Tuesday, canonised the late General as one unfairly demonised, the import of that eulogy may be totally lost on more than half of Nigerians. Speaking while receiving a delegation of the Buhari Support Organisation (BSO) which held at the Presidential Villa, Buhari literally said he didn’t care what opinion the whole world may have about Abacha but that the late General was worthy of being part of the societal role of honour. “No matter what opinion you have about Abacha, I agreed to work with him and the roads we did from PTF exist from here to Port Harcourt, to Onitsha, to Benin and so on,” he had said. The PTF was the Petroleum Trust Fund, where proceeds from petroleum price increase were kept. In crude comparison, the PTF could be said to be the equivalent of today’s excess crude fund, which is shared in billions by state governments. Buhari was appointed by Abacha as head of the fund, which was reputed to have constructed many roads in Nigeria. Apart from diverse allegations of fraud against its operations, the PTF was alleged to have concentrated its construction efforts heavily on the Northern part of the country, while merely depositing tokenisms in the South, incidentally where the oil money was excavated. To be fair to Buhari, his obsessive defence of Abacha predates his presidency. At the tenth anniversary of the death of Abacha that was held in his home State of Kano in 2008, Buhari and his successor, General Ibrahim Babangida, claimed that Abacha never stole Nigerian money but that the goggled General was indeed the cement which wedged Nigeria together. Until recently when he acknowledged that there was a tranche of the Abacha stolen money to be repatriated to Nigeria, even as president, Buhari refrained from referring to Abacha’s heist as loot. In a tweet shared on April 27, 2016 by his official twitter handle, @NGR President, Buhari still refrained from calling the monumental theft by its name. He merely tweeted: “Nigeria is awaiting receipt from Swiss Govt. of $320 million, identified as illegally taken from Nigeria under Abacha” (emphasis mine). The way the man they claim loathes corruption abets and romanticise the globally acknowledged corrupt government of his benefactor, fellow Northerner and military General, Abacha is so nauseatingly endemic that, if it was humanly possible for him to beatify the late General, Buhari would do so without batting an eyelid. Buhari is not alone. Former chief of army staff, General Ishaya Rizi Bamaiyi (rtd.) is a graduate of this school of infamy. While launching his hagiography entitled Vindication of a General, Bamaiyi said that references to ‘Abacha’s loot’ were farcical and a media creation. Abacha, he said, merely deposited the money in those foreign countries to meet “international obligations.” He claimed that a decision was reached by the military council because Nigeria’s western allies were hostile in disposition to her aftermath the execution of Ken Saro-Wiwa. Bamaiyi could not explain why those monies were deposited in Abacha’s name. It has been alleged that foreign asset worth U.S. $3 billion were traced to Abacha, his family, representatives and accomplices. In 2002, the Obasanjo government agreed with the Abacha family during the trial of his son, Mohammed, to retrieve $1 billion, out of a frozen sum of $1.1 billion, under a quid pro quo agreement that the Abacha family keeps the balance. Estimated theft of Nigeria’s looted fund by Abacha, hiding under the veneer of purchasing ammunition to fight the Sierra Leonean war, is put at between $2 to 5 billion dollars. This amount approximates about 10 percent of Nigeria’s five-year oil earnings. Switzerland, Liechtenstein and Luxembourg confirmed to Nigeria that they had chunks of Abacha’s stolen loot with them, so also did Jersey, Belgium and the UK, which have in fact repatriated over $1.2 billion to the Nigerian government. The Olusegun Obasanjo government also confirmed that, working closely with some international anti-corruption agencies, over £2 billion were found stashed away by the goggled General in the U.K., the U.S., Singapore, Dubai and Hong Kong. The financial brigandage inflicted on Nigeria by Abacha is perhaps the minutest fraction of his atrocious four-year rule. While Buhari as the PTDF chairman relished the majesty of his office and humongous national cash at his disposal, Nigeria was under the heavy yoke of repression under Abacha. Many families lost their breadwinners to his iron-fist rule. He was unarguably the most bloodthirsty ruler the country has ever had – our own version of Hastings Kamuzu Banda. He killed those whose voices clashed with his oppressive rule, like a sledge hammer mashes a gnat. Wife of late billionaire and winner of the June 12, 1993 election, Kudirat Abiola, was killed in Lagos one bright morning in July. Even though Sgt. Rogers, a man in whose veins blood seldom flowed, acknowledged that he indeed pulled the trigger that silenced the amazon on the orders of Abacha’s chief security officer (CSO), Major Al-Mustapha, nothing has been heard of that murder and Mustapha was eventually wriggled into freedom under a questionable legal haze. Osibakoro Alfred Ogbeyiwa Rewane, Suliat Adedeji, Toyin Onagoruwa and many more were assassinated in what was clearly government bloodletting and till date, none of their killers have been fished out. It was the same Abacha who ordered the killing of writer and activist, Ken Saro-Wiwa and his Ogoni eight brothers by hanging. Later revelations showed that he killed General Shehu Musa Yar’Adua in detention through poisoning, allegedly under a long-nursed anger over family rivalry; he had Abiola detained and would have executed General Obasanjo but for the inexplicable intervention of providence. This was the same man President Buhari sought to beatify in an arrogantly ignorant attempt to make his corpse walk. While Abacha’s Hitler-like government reigned, urban terrorism took hold of Nigeria. On Thursday, May 7, 1997, bomb blasts went off at 7 a.m. on Herbert Macaulay Road, Lagos; the sixth in six months. Many activists, including Chief Olu Falae, were hauled into Ikoyi prison. When they were eventually brought up for trial, police prosecutor, Superintendent of Police Nuhu Ribadu ensured that their plea was not taken. Another bomb went off in Ibadan. Abacha continued his Papa Doc kind of rule. He dared the U.S. and Britain by refusing to detain and even received Muammar Ghadaffi of Libya, who had arrived Kano with seven aircrafts, in contravention of the UN resolution that he be apprehended anywhere he went in the world, maintaining that Nigeria would not bow to any foreign dictation. I just hope Bola Tinubu, Wole Soyinka, Kayode Fayemi and co realise the equivocation in fighting and vanquishing Abacha as members of NADECO, retaining their lives by the whiskers, yet being major cast in this grotesque drama of vicariously shouting “Long may you reign, General Sani Abacha!” through their support for his sidekick, Muhammadu Buhari? Nigerians were hugely terrorised by his goons. Bagauda Kaltho, a journalist, was bombed to death in Kaduna and many opposition figures disappeared. On May 1, 1998, seven persons were killed in a May Day riots in Ibadan. Journalist, Chiedu Ezeanah was shot in the rib as protesters set 30 reels of Monitor newspaper on fire. Arisekola Alao, a known Abacha apologist, later had his limousine also set on fire by protesters. Three innocent citizens on admission at Lifecare hospital on Ring Road, owned by a man seen to be sympathetic to democracy activists, were shot dead by Abacha’s goons, allegedly under the instruction of a billionaire friend of Abacha’s. Bola Ige, Lam Adesina and Femi Adeoti, were hauled into detention as a result of the chaos. But for death which sneaked in like an incubus to rescue Nigerians off him, Abacha employed a stranglehold alien to Nigerians to ensure his transmuting from a military to civilian dictator. He pioneered the minister of telecommunication, Adebayo Shittu’s recent cloning of the cheap distribution of Buhari T-shirts at the executive council meeting, as the Abacha badge was worn by members of the Provisional Ruling Council (PRC), state administrators and ministers. The above would put in proper perspective our president’s adulation for his fellow kinsman, the infamous Sani Abacha. 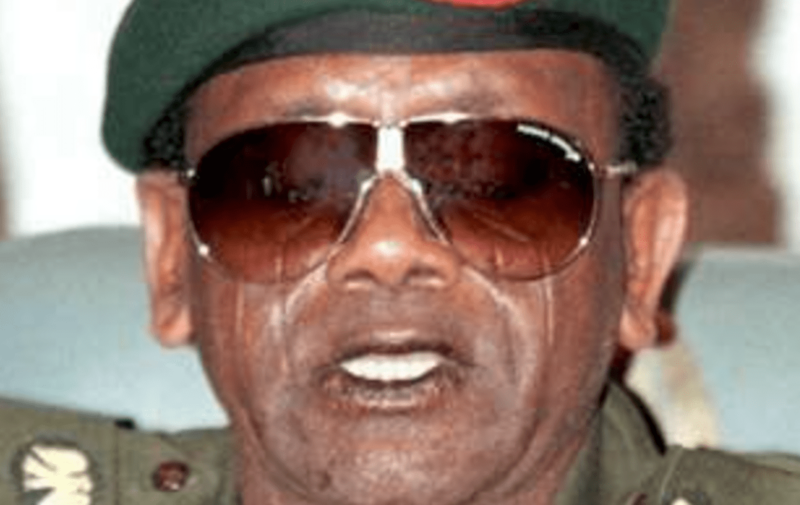 “No matter what opinion you have about Abacha…” he had said. No matter what opinion the world has? This mindset is akin to some unabashed Germans’ who see fascist and racist Adolf Hitler as a German nationalist, being the brain behind the world famous Autobahn, the construction of road networks in Germany and the founding of the world renowned Volkswagen auto assembly, notwithstanding his killing of six million Jews and plunging the world into a war. What should worry the world, nay Nigerians, more is the infusion of Abacha’s men into the Buhari government and the obvious cloning of the Kanuri-born General’s template of sectarian despotism in a democracy. Nigerians may have forgotten that the comptroller-general of the Nigerian Customs Service, Hammed Ali was a member of the army tribunal which executed Saro-Wiwa. As compensation for this blood-spillage, he was immediately made the military administrator of Kaduna State. Did anyone see him grinning from ear to ear last week at the Villa, while Buhari beatified the goggled General? Abacha’s ADC, Colonel Muhammad Mustapha Abdallah, is the director general of the National Drug Law Enforcement Agency (NDLEA) today. Baba Gana Kingibe, Abacha’s guttural-voiced minister of Internal Affairs, is said to be a major player in Buhari’s kitchen cabinet. Al-Mustapha is also rumoured to play a vital role underground in the Buhari government. Who else? I just hope Bola Tinubu, Wole Soyinka, Kayode Fayemi and co realise the equivocation in fighting and vanquishing Abacha as members of NADECO, retaining their lives by the whiskers, yet being major cast in this grotesque drama of vicariously shouting “Long may you reign, General Sani Abacha!” through their support for his sidekick, Muhammadu Buhari? Ondo State was in the news during the week. Iroju Ogundeji, deputy speaker of the State House of Assembly, who represents Odigbo constituency, was removed during plenary. His removal motion was moved by Fatai Olootu who represents Akoko North. The motion was seconded by Malachi Coker who represents Ilaje 2 constituency. Ogundeji’s sins, according to Olootu, were legion. Among them was that he was constantly in conflict with the speaker, was arrogant and brought down the office in his conduct through an alleged rudeness to the speaker which, in the lawmaker’s estimation, caused palpable embarrassment to the Assembly. Immediately after Ogundeji’s impeachment, he was duly replaced by the lawmaker representing Ile-Oluji/Oke-Igbo, Bimbo Fajolu. His nomination as deputy speaker was moved by Israel Olajide and seconded by erstwhile speaker, Jumoke Akindele. However, the following day, a reversal came. The House, I gathered, was given a marching order by the power-that-be at the Alagbaka Government House to swallow its vomit like a dog. Indeed, the wording of the threat-laced decree was said to have been, “reverse… or else…!” That order was pregnant. It meant so many things, from the threat of “you may not come back after 2019” to “you’ll be poorer than the church rat!” And pronto, as the Americans say, the parliament’s tiger lost its tigritude. The House did a sorry somersault. Like a dog which lost the wagging of its tail, the House returned to status quo ante and Ogundeji was re-made deputy speaker. So, what happens to the new deputy speaker duly elected? Drafters of the constitution who wanted independence of the three arms of government lost their deposits. Democracy walked one step forward and waddled two steps backwards. …the battle to install a successor is no doubt a battle of Fayose’s life. Having courted the red eye of the presidency through his ceaseless disdain and talk-down on President Muhammadu Buhari, Fayose is well aware that between a cudgel and a prison, the APC has moulded an unpleasant out-of-office for him and will deploy street tactics to rout his traducers. Immediately the gubernatorial candidate of the All Progressives Congress (APC) in Ekiti State, Dr. Kayode Fayemi, released his 77-man campaign team for the July election in Ekiti State, it must occur to anyone who is a student of Nigeria’s not-too-recent history that, unless providence intervenes, Ekiti will soon shuttle backwards into 1983 old Ondo State. The Fayemi team comprised the who-is-who in the party and those who could heave heavy cash into Ekiti at the snap of a finger. Ondo 1983, you will recollect, was a clash of federal political might and local muzzles. At the end of the day, weeping, wailing and gnashing of teeth were left in their trails. Dogs lapped blood of humans and ate charred bodies on the streets of Akure, the state capital. What makes the situation potentially scary is the character of the man APC is poised to worst in the election. Ayo Fayose, unlike Michael Adekunle Ajasin of 1983 who was an urbane school teacher, is abrasive and not your run-of-the-mill gentleman; he is indeed your definition of a street boy, in all its portents. Either by default or a regress in the values that Ekiti used to stand for, Fayose is said to be a man that is widely loved by his people. More importantly, the battle to install a successor is no doubt a battle of Fayose’s life. Having courted the red eye of the presidency through his ceaseless disdain and talk-down on President Muhammadu Buhari, Fayose is well aware that between a cudgel and a prison, the APC has moulded an unpleasant out-of-office for him and will deploy street tactics to rout his traducers. When Fayose’s iron hits the presidency’s iron in July, one must surely bend. For this purpose, I accept the tag of a prophet of doom. What I see in the horizon is blood, blood, blood.